339. Aug 28, 2005. New apartment. New problems. The 7-month-old Schnauzer faced change management practices in the new apartment. 338. Aug 28, 2005. Stops licking front paws now that a new male Golden Retriever keeps him company. Mounts puppy. Moved to terrace house. The Spitz has his own newspaper toilet area. Puppy uses another newspaper. 2nd sheet of 3 sheets of papers re-used. 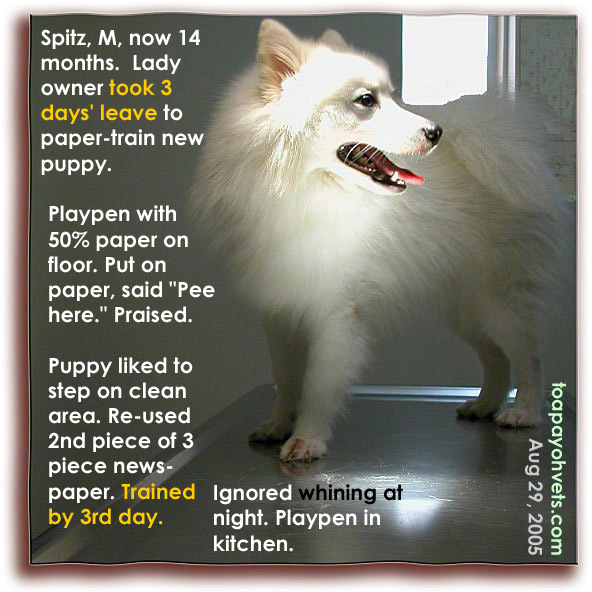 Puppy paper-trained fast too. The lady who researched toilet-training. 337. Aug 28, 2005. The Pom pushes the stools into the pee tray. 336. Aug 28, 2005. 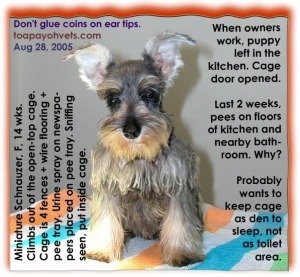 The Schnauzer knows how to climb out of the playpen. 335. Aug 28, 2005. 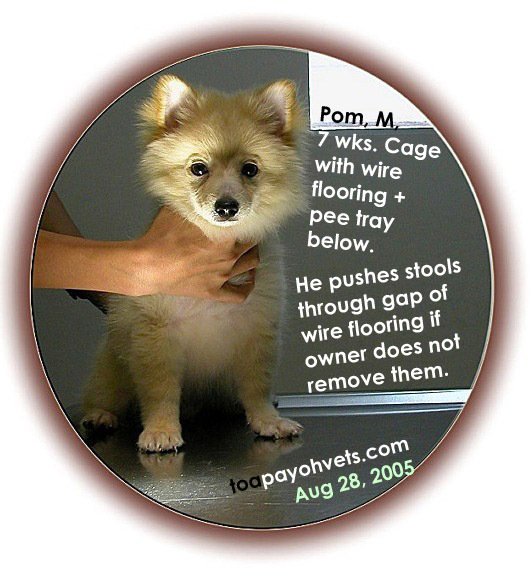 Best method of toilet training. 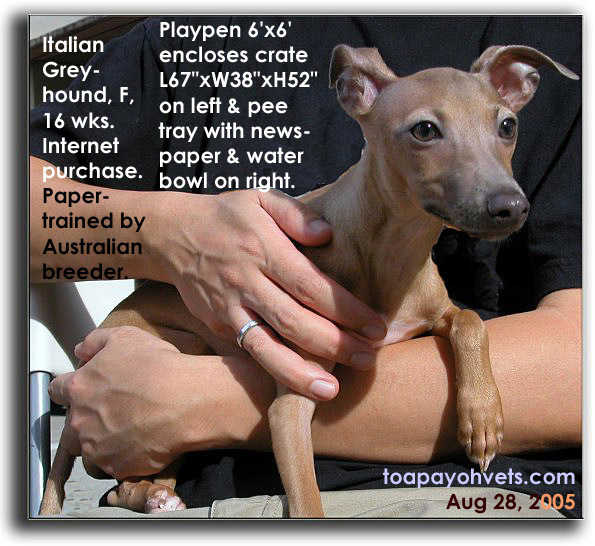 The Italian Greyhound had the ideal set up for toilet training. 334. Aug 28, 2005. 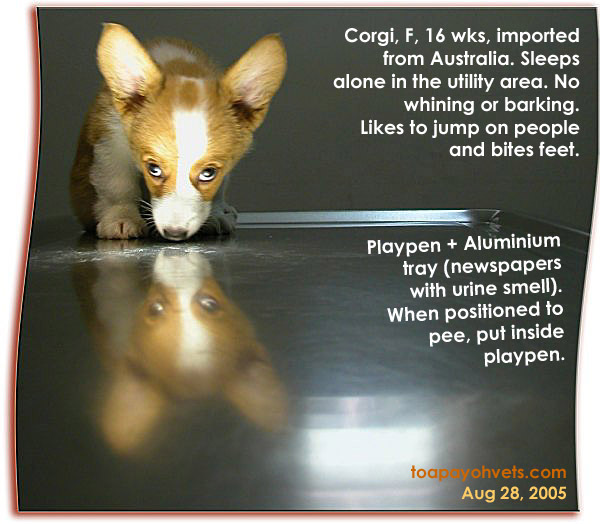 Was the Corgi's inflamed navel irritated by urine on the floor and why did the groomer clipped her navel area? 333. Aug 27, 2005. The whole apartment is the Jack Russell's toilet. 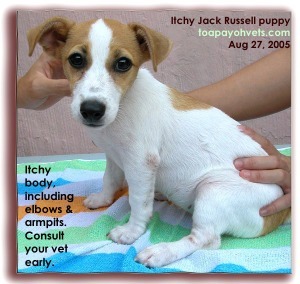 The toilet-training book will be most useful for the Jack Russell owner. 332. Aug 27, 2005. Had a lot of hair some-time ago. 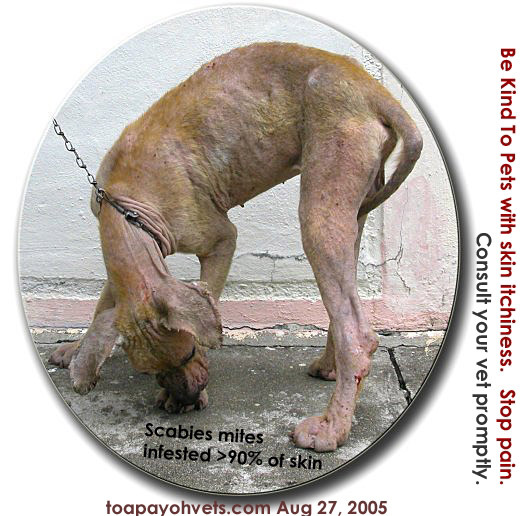 Now, scabies mites infested >90% of the skin. 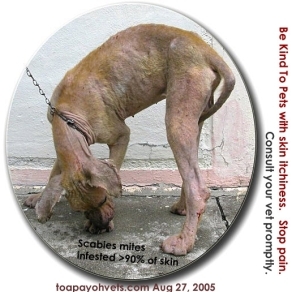 Sarcoptic mange is easily treated and cured. 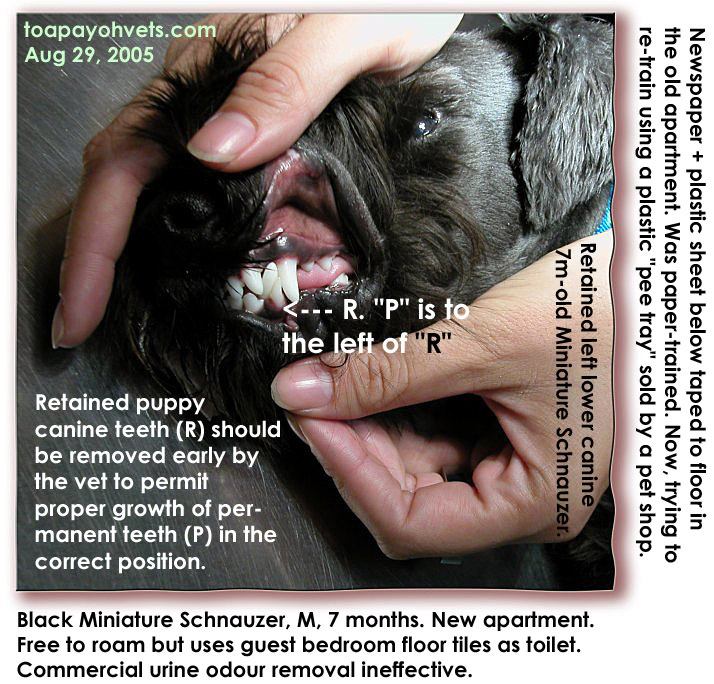 Consult your vet early. "What should we do?" the staff asked. There was an older lady who was concerned enough to bring the dog's wet sweater to wash and dry using the bathroom's hot air hand dryer. The Chihuahua was dried similarly. Overnight, the SATS staff made sure the Chihuahua was dosed with a bit of water mixed with maple syrup from a fast food chain. He was also pinched on the neck skin hourly. There was a written schedule pasted on top of the desk. The room, filled with 15 helpful and caring staff was fortunately not freezingly cold unlike some offices. The white light on the table top kept the Chihuahua warm. 330. Aug 24, 2005. Saigon-Munich via Singapore by air cargo. 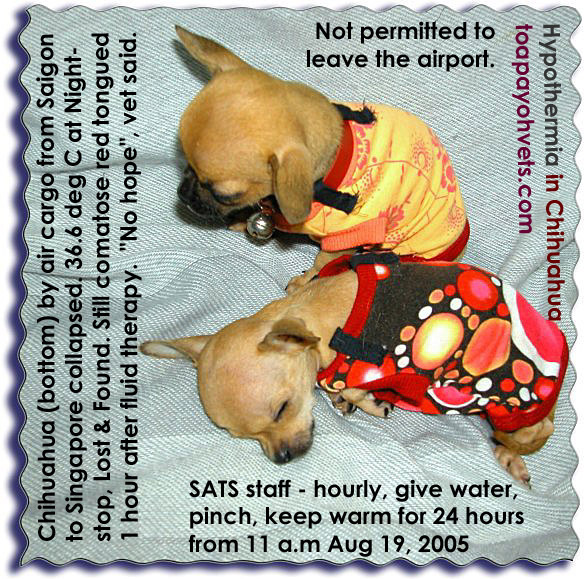 One collapsed Chihuahua (bottom) due to cold temperature at cargo hold of plane. Singapore Airport Terminal Services (SATS) called a vet. However, the Chihuahua did not wake up after fluid therapy. Not permitted to leave the airport due to quarantine regulations. The vet tried to revive the dog for one hour. It was futile. He would blink his eyes and then went into a deep sleep. Doubted he would live. "He might survive if you all nurse him well," the vet said to the staff. None had experience. So, there was not much optimisim. 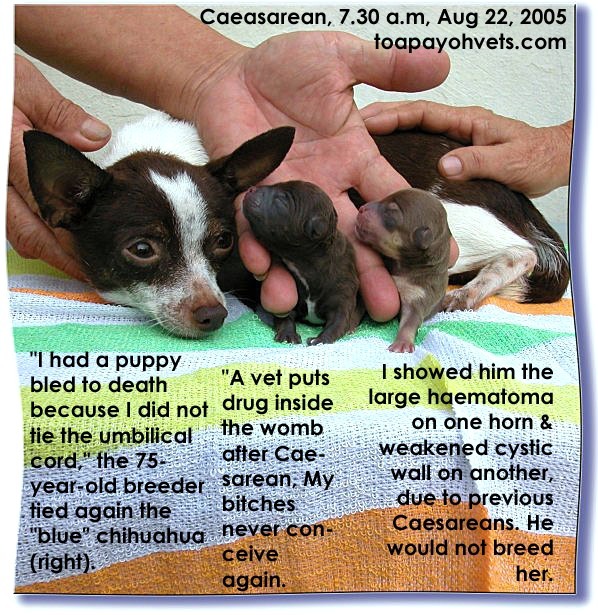 At 8 a.m, the SATS officer phoned the vet: "The Chihuahua is still alive." He phoned again to make sure that the vet turned up. The vet woke up the dog and put him near ground up dried dog food mixed with maple syrup. He was ravish and ate a lot. Drank some water too. Shipped back to Saigon. An earlier batch of 3 Chihuahuas sent to Munich. 1/3 died on arrival. So, the owner did not want the Chihuahuas to go to Munich. 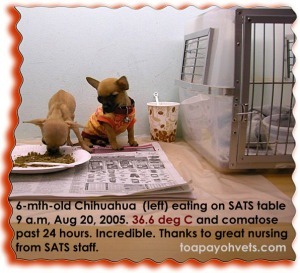 The 2nd Chihuahua (right) had breathing difficulty and soft stools but had normal temperature. Both were flown back to Saigon at 3 p.m on the same day. Great nursing from the SATS staff saved the life of the comatose Chihuahua. An incredible but true tale of a Chihuahua fighting for its life in Singapore's Airport saved by the caring love of the SATS ladies and gentlemen. 329. Aug 24, 2005. Starts whining and barking when left alone in condo. Best not to spend too much time with new puppy for first 14 days to discourage barking habits. 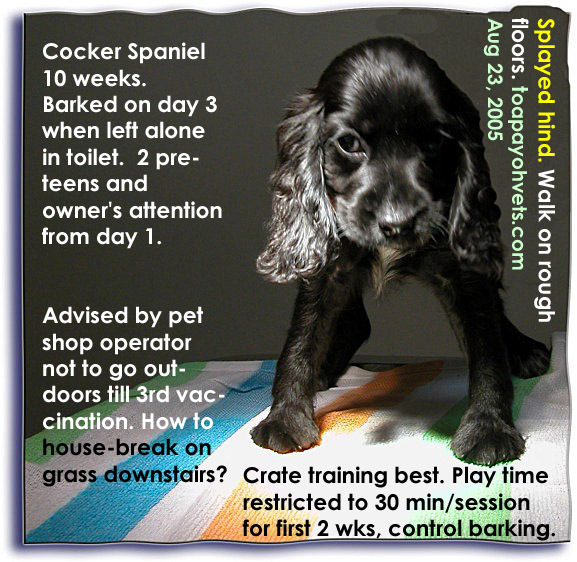 The barking Cocker Spaniel puppy. 328. Aug 24, 2005. The professional breeder who contracted this Miniature Schnauzer to a home breeder might not pay. 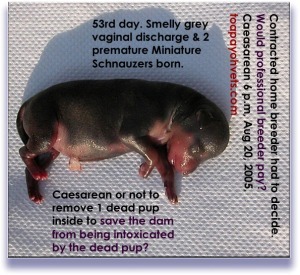 The home breeder wanted to save the mother rather than wait and hoped that the remaining pup might be passed out and killed the mother died as a result of his delay. 327. Aug 24, 2005. The young experienced breeder gave up on the cyanotic pup after 10 minutes. Gave to my assistant James to handle after 10 minutes of reviving. Yet, it survived and was very vigorous but cyanotic (CE). 326. Aug 23, 2005. The breeder noted that the thread had come off. Re-tied the umbilical cord. The above was not a blue and tan Chihuahua. Note that pups are in excellent body condition from this senior breeder. 325. Aug 23, 2005. Very experienced breeder knew chihuahua needed an emergency Caesarean and saved 2 vigorous pups. 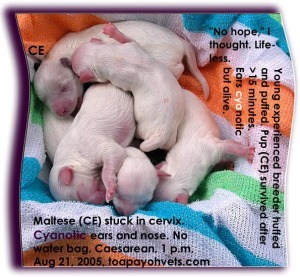 Surprisingly, the wife did not handle Caesarean pups.